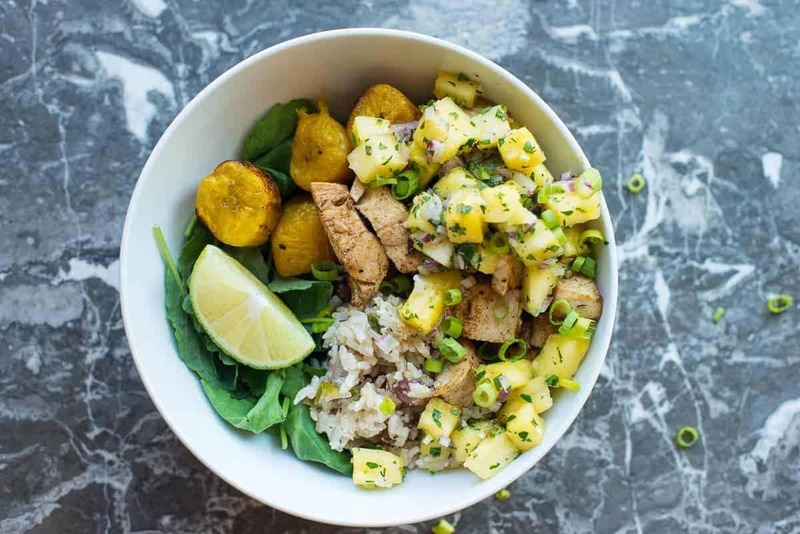 Jerk chicken cooked in the oven served with roasted plantains, Jamaican rice, and peas, and then topped with spicy sweet pineapple salsa. 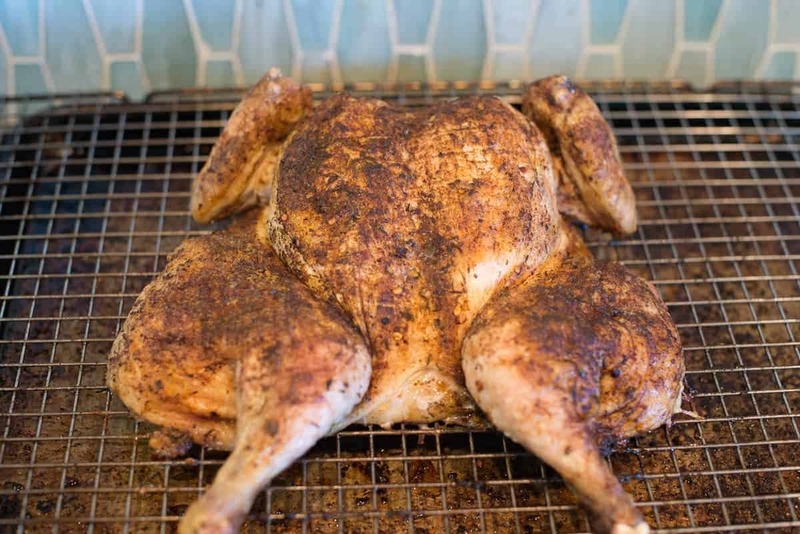 To make jerk chicken in the oven, simply rub the chicken with jerk spice rub and roast it. This is the easiest jerk chicken recipe ever! When you pull this lovely bird out of the oven, the result is a crispy-skinned bird with a wonderful spicy Jamaican flavor. I roast the chicken on a baking rack over a heavy sheet pan. This allows air to circulate under the bird. Pro tip: You can use this rack technique for a cut up fryer or for just a bunch of chicken thighs or breasts that you might be cooking up for your weekly meal prep. Wait a second; my chicken doesn’t look like that! How’d you get it so flat? For this beast bowl, I decided to share a technique that I use all the time in my kitchen – spatchcocking. Besides being super fun to say, spatchcocking is an easy way to reduce the time that it takes to cook a whole bird. By spatchcocking the bird, you can get seasoning easily all over the meat, and your chicken ends up nice and crispy and evenly cooked. As a bonus, it’s also super easy to carve. To spatchcock a bird, you will need a nice pair of kitchen shears to cut the backbone out of the bird. This is very easy. Using the kitchen shears, just cut along either side of the backbone and pull it out. Next, turn the bird over and press it flat. Congratulations, you have spatchcocked your bird! See, easy! The raw backbone in this photo will go into a stock pot with carrots, onions, celery, a few spices and the ‘extras’ that always come inside your chicken. I will also add the remainder of the carcass from the bird after it is carved. See my recipe for bone broth to see how to make this healing staple. And now onto the rest of this Beast Bowl. 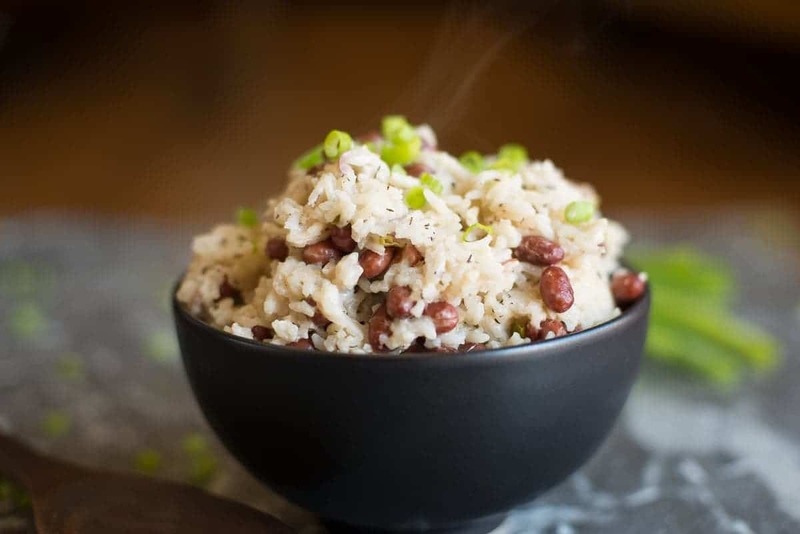 Jamaican Rice and Peas is a traditional island staple. This Caribbean flavored rice has a mild coconut flavor and is usually made with pigeon peas. However, sometimes these are hard to find in your local grocery store so I’ve substituted small red beans. If you spend any time around my house for dinner, you will know that I love salsa. Chips and salsa are one of my snacking weaknesses. Salsas add a bright, spicy flavor to anything. Traditional salsa fresca is something that I almost always have in the fridge for eating on eggs – or anything. 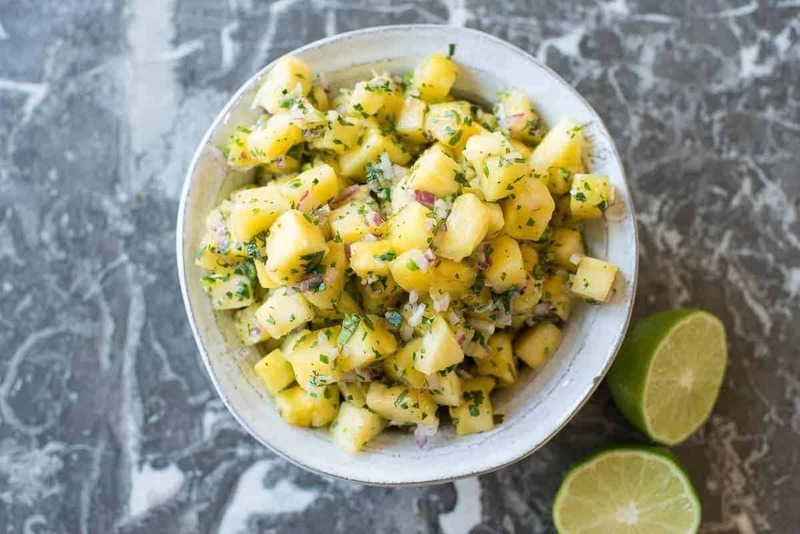 This pineapple salsa is so good! I love the sweet pineapple paired with savory ingredients. I chose to use serrano peppers in this salsa – they are spicier than jalapeños and have a sharp bite to them. They are my preference in any salsa, but I know everyone doesn’t love things as spicy as I do. In this salsa however, the serranos are toned down because there is so much sweetness from the pineapple. The beauty of making your own salsa is that you can dial in the spice just the way you want it! I roasted my plantains in a cast iron skillet in the oven right alongside my chicken. They came out perfectly done. While everything was cooking in the oven, I made the rice. Then while the rice was simmering, I made the salsa. My cooking plan of attack for this beast bowl. Spatchcock chicken, rub it down with jerk seasoning, get it in the oven. Peel and cut up plantains, get them in the oven. Make rice while the chicken is cooking. Once rice is on simmer, make salsa. Make sure to keep an eye on chicken and plantains while cooking rice and making salsa. I hope you enjoy this beast bowl. If you like our recipes, please follow us on your favorite social media. We are on Facebook, Instagram, and Twitter, and we are working to bring some videos to our YouTube Channel. Keep your eyes out for new content. Sign up with your email and get insiders content delivered directly to your inbox. 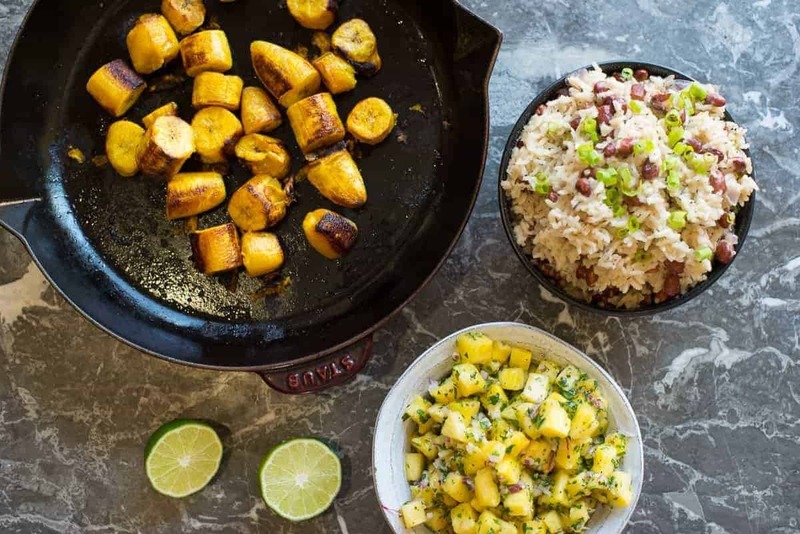 Easy jerk chicken served with Jamaican rice and peas, roasted plantains and pineapple salsa. This beast bowl is full of island flavor. Use either a whole chicken, spatchcocked or cut up parts. Rub chicken with jerk seasoning rub. Place chicken on roasting pan. Roast until chicken is 165℉. Time will vary depending on cut of chicken. When cooked to the proper temperature. Let rest at least 10 minutes before slicing. Slice and store extra chicken to make lunch and dinner the rest of the week. Peel plantains and cut into 2 inch pieces. Toss in oil and salt. Drain the red beans, make sure to reserve the liquid for cooking. Set Aside. Add enough water to the measuring cup to bring the liquid up to 4 total cups. Set aside. Add oil to medium sized sauce pan. Heat on medium high. Add yellow onion and garlic, cook for a few minutes until fragrant and translucent. Add the rice and cook for a few minutes until rice is coated with oil. Add beans, green onions, thyme, salt, and liquid to pan. Stir. Reduce heat to simmer, cover and cook until all liquid is absorbed. About 20 minutes. Stir occasionally. Add all ingredients to a bowl and stir. I served these with just a handful or two of baby kale greens. They are bitter and pair nicely with the sweet salsa and spicy chicken. However - the magic of the beast bowl is that you can add any base fixings that fit your mood. My go-tos are romaine and spinach, shredded carrots, red peppers, and purple cabbage.